The perfect bib for teething babies! 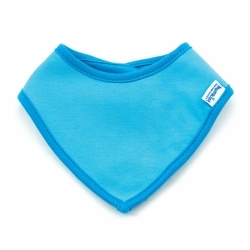 Made from soft, 100% cotton with an inner waterproof layer that keeps babies clothing dry, while still offering the comfort of a natural fabric when used for wiping the face. Fashionable, reversible design. Adjustable snap closure allows bib to fit up to 9 months. Machine washable. Bib measures 5” from neck to bottom point.